Of all the busy shopping lanes and malls in Vienna, Mariahilferstraße is by far the busiest. But it does have its quite corners - one is the Mariahilfekirche Church, also known as "Kirche Maria Hilf" or "Barnabitenkirche". It gave its name to the road and the entire 6th district. You will notice when you are close to the church by the high number of bums that constantly besiege Mariahilferkirche; this is due to the homeless shelter "Gruft", which is located at the base of the former Barnabite monastery. I used to live in Barnabitengasse Lane just next to the church (in a proper apartment, not the homeless shelter) and I am quite fond of the twin-towered Baroque building. Like most of Mariahilf, the area where the church is now used to be agricultural land up to Renaissance days, primarily used for vineyards. There was a small church since the Middle Ages, but in the course of the Second Turkish Siege of Vienna, the immediate surroundings of the city were completely devastated. This applied to the villages in the area of today′s Mariahilf (the sixth district of Vienna). Once the Turk′s were defeated, the Viennese clergy and nobility happily purchased the now rather cheap land outside the city walls. The Baroque church that you see today was built between 1686 and 1689 for the Barnabite monks, a religious order that had previously been located at the Michaelerkirche. The Barnabites were important allies of the Habsburgs in the counter-reformation, but today, there are none left anywhere in Austria. In Italy, there are still some convents. The last Barnabites left Vienna in the 1920ies, after which the Salvatorian order took over both churches, the Mariahilferkirche and the Michaelerkirche. Back to an earlier stage of its history: Between 1711 and 1715, the building was remodelled and extended and once again between 1721 and 1726. In the interiors, a copy of a famous painting of the Virgin Mary from the Basilica of Passau in Bavaria was installed. The original painting was made by Lukas Cranach the Elder in the early 16th century and displays Mary as "theotokos glykophilousa" in Byzantine style. With the spread of Mary pilgrimages during the counter-reformation, Mariahilf gained importance and the church ensured a constant cash flow for the neighbourhood. Most of the interiors are from the later 18th century and in late-Baroque and Rococo style; a sad exception are the windows, which are mostly historicist 19th century rubbish. The left tower of the Marihilferkirche contains the "Schustermichel" ("Shoemaker Mike" or, according to an alternative translation, "Mike the Fucker"), Vienna′s second-biggest bell after the Pummerin in the Stephansdom Cathedral. It weighs an impressive 4.5 tons. 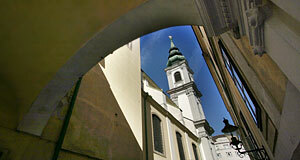 In front of the church you see a memorial of Joseph Haydn, who lived and died in the district of Mariahilf. Haydn′s living (and dying) place is now maintained as one of the Musikerwohnungen ("Composer′s Flats") by the Wien Museum. Continue with "Mariahilferkirche - Part II"